As part of an effort to be balanced in the final stages of a Phd on counter-terrorism,I recently spent six weeks in Palestine ‘to see things for myself’. I can’t think of another ‘place nor issue’ in world affairs that is more emotive, misrepresented, ‘linked to terrorism’, and further sits at the heart of grievance in the Muslim world. I was in Palestine for the mass shooting of protestors, the alleged assassination attempt of the Palestinian Prime Minister, and the lead up to the opening of the U.S embassy in Jerusalem. On my father’s side like many Australians, I am a descendent of convicts but on my mother’s side my biological grandfather was a Jew who was killed in the second world war. In Australia this was little more than interesting but in Palestine I was warned that being careless with such knowledge could result in my death; clearly there was going to be some challenges.I am no stranger to international relations; and have trained staff for deployment in a number of global hot spots. Furthermore, as a former Queensland police officer, and in response to 9/11, I was appointed as the State Islamic Liaison Coordinator. In any case, I felt that a stint in Palestine would not only be good for my research but help me connect with my Jewish side that I knew nothing about. Through networks including the International Police Association I made contact with Israeli authorities and was soon informed by a seasoned Israeli commander and former regional head of counter-terrorism that I was ‘evidently a nice guy with good intentions but dangerously unaware that I was about to get myself killed’. Upon crossing the border, I quickly observed that Hebron is considered the most conservative Islamic city on the west bank. If a woman was not wearing a hijab, then simply she wasn’t from Hebron.I found myself in a small 400-year-old stone dwelling where the front clearly bore the wounds of machine gun fire. I shared a room with a young American who had in recent years converted to Islam, and later declared his hatred of America and outrage at Israel. He was personable but I suspect that if opportunity presented itself, he would easily transition to a foreign fighter. The realization of being in a different world came quickly,in the street where I was staying, and within days of my arrival,a young Palestinian was killed by Israeli soldiers.I quickly discovered that not a week would pass where I did not hear gunfire,grenades or smell tear gas.In these circumstances,I commenced the task of finding answers and met with members of HAMAS, FATAH, JIHAD, the Palestinian Authority, the United Nations, Israeli and Palestinian academics,international observers, past political prisoners, Israeli soldiers, and intelligence officers from both Israel and Palestine. More importantly, I met with scores of average Palestinians to discuss the conflict,sometimes into the early hours of the morning. I found that both Israelis and Palestinians treated me with tremendous respect. My first observation was that 95% of the Palestinian people were not only incredibly friendly but amazingly protective and hospitable. Almost at every door, I was invited in and afforded amazing hospitality. An endless number of Palestinians would routinely extend the hand of friendship to ensure that I immediately understood that I was welcome in Palestine. I was further amazed to observe that shop owners routinely left their shops open and unattended to go away and pray, yet they would always return to find that nothing had been disturbed or taken. I couldn’t help but notice that the Palestinians were a people with many virtues and reasons to be respected. My second observation was the astounding growth and progress of Israel, and the amazing discipline of the Israeli people despite their differences which is further evidenced by the only functional democracy in the Middle East.Like the Palestinians, the Israeli people are generous and respectful but not surprisingly often guarded. On one hand I found myself full of admiration for Israelis, and pride in my Jewish ancestry,yet on the other, if I have to be honest, I was disturbed by the apparent ease that most Israelis were able to stomach the suffering of the Palestinian people. In fact, at times it seemed very cold. Within days of the mass shooting in Gaza, I met with a world renowned Israeli academic, and asked why soldiers had used real bullets instead of rubber bullets that would have achieved the same objectives. The very casual response I received was; ‘real bullets or rubber bullets, people die’. It just seemed soblazei, yet the difference between rubber bullets and real bullets was dozens of unnecessary deaths and hundreds of critical surgeries, yet it all seemed so unimportant. I also heard other comments that included ‘they are all terrorists and deserve to die.’ I was surprised as at times, these were comments from Israeli civil leaders, not street red necks. I must admit that I felt some sense of empathy for Israel stemming from the 2005 handing over of Gaza to the Palestinians, which huge gesture of peace was insanely followed by rocket attacks to kill Israelis. In this vein, it appeared that most Israeli’s felt that it does not matter if they try little or lots, nothing will change, and there will be no peace, so why at all. In other words, I sensed that many have lost complete hope that peace is still a real possibility. As one who was trained in Psychological Operations at the ADF school of Military Intelligence, I understood that if you can convince soldiers to believe that a target group are dogs then you have created justification to treat them like dogs. This is based on a notion that the enemy always brings an aggressive response upon themselves, or in other words – ‘they get what they deserve’.In this regard, from personal observation I would say that the dehumanisation of the Palestinians among Israeli soldiers (and by no means all soldiers) is undeniable. In response, many would argue that the same type of dehumanisation of Israelis occurs among the Palestinians, and I would agree, however I would quickly point out that a disparity in access to weaponry carries different responsibilities and consequences. 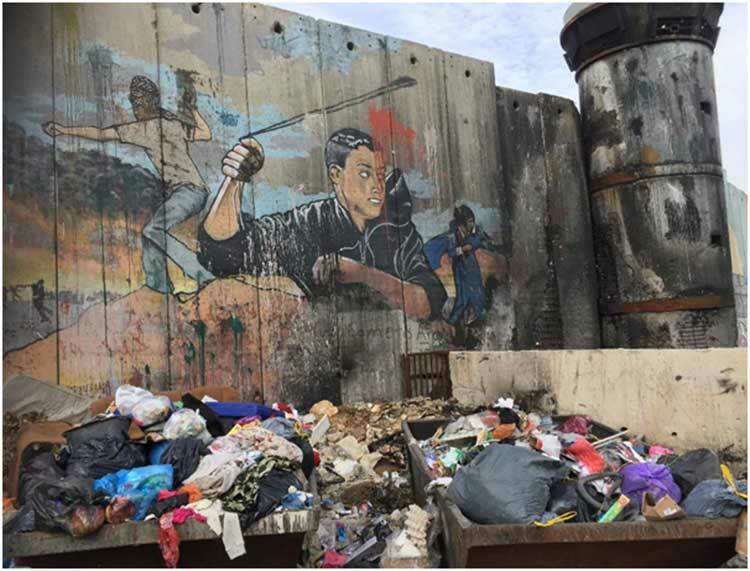 Some may respond that there are clear examples where Israeli soldiers have been arrested for acts of injustice against Palestinians, but such events are few and far between, and usually only possible through indisputable camera evidence. The point is that no state can expect the prospect of sustainable peace without justice, and justice will never be achieved where there are examples of Israeli soldiers who unlawfully killed Palestinians and serve the same prison sentence as Palestinians who threw rocks at Israeli soldiers. Don’t take my word for this type of injustice, there is an organisation of former Israeli soldiers called ‘Breaking the Silence’ where members have been ostracised and ridiculed for their courage to speak out against‘injustice’. Furthermore, I spoke with international observers who are consistently frustrated by the constant non-responses from Israeli authorities to the constant flow of reports documenting claims of injustice. In this regard, it is easy to only criticise Israel but I have to say that I do not agree with the many who advocate that Palestinians are completely powerless, and that all power for change lies with Israel. In this vein, I am strongly of the opinion that it doesn’t matter what solution is proposed by Israel, it will fail in the absence of capable Palestinian leadership. As such, I cannot overlook the critical recognition that the peace process would be much further ahead if Palestine had better leaders. Sadly, I have significant animosity towards a number of Palestinian leaders which is commonly the case among many Palestinians. Sadly, Palestinian leaders too often draw upon the weakest, easiest and non-sustainable way to create solidarity by demonising and dehumanising Israelis. In view of the many perceived and real injustices, this is not a difficult task but sadly it creates a dangerous energy that is completely destructive to any hope of sustainable problem solving. In this regard I witnessed the spreading of propaganda by some leaders suggesting that the Jews never existed in Palestine, and that the only remedy to the conflict is the complete removal of Israel from the Middle East. On such days, my heart would sink as it had never been clearer that more would die, and the vast majority of those killed would be Palestinians. But I also couldn’t overlook that Hebron has been the scene of much bloodshed and slaughter, and I would have been surprised if the reaction was otherwise. I rarely met a Palestinian who truly believed in their political leadership; and clearly there were widespread perceptions of political corruption. Furthermore, it was deeply concerning that almost all of the young Palestinians only ever expressed negative opinion and disinterest with politics. Once again these views can be independently supported by Palestinians who were born abroad and have been educated in some of the world’s best universities; and despite enormous passion of returning to Palestine in hope of making a difference, have been frustrated by a culture of nepotism and corruption found within their own political leaders. The point is that without strong representative Palestinian and Israeli leadership, any and every solution is non-sustainable. Despite pride in my Jewish ancestry for many reasons, I am undeniably ashamed of Israel’s deadly response to the land march which sets an extremely dangerous precedence that will no doubt result in the deaths of thousands more. Before the Gaza protest, I interviewed a number of Palestinian leaders who were painfully aware that a show of force against the might of Israel would only result in the death of many Palestinians. Some of the HAMAS and FATAH leaders spoke directly concerning the example of Ghandi and the notion of passive resistance stating that clearly violence had not worked, and that it was time to try a peaceful protest, but, not surprisingly, there was tremendous anxiety as to how Israel would act. Well, Israel has reacted, and many, including myself were stunned. In response, I see the Israeli media has labelled the protest as terrorism. Well, I don’t think it was, and if it was, then surely the Palestinians are the world’s most foolish terrorists to turn up to a gunfight without guns, which is further evidenced through no loss of Israeli life. I think Israel needs to realise that in the long run, the consequences of shooting unarmed protestors will be far more devastating than shooting terrorists, and in time the unintended consequences will be painfully felt. I think that we need to view the situation as a garden and be very clear about the type of seeds that are currently being planted, because a seed can only grow according to its own kind. In terms of psychological warfare, a feature of ‘justifying injustice’ is to respond that as dogs the Palestinians brought this harsh treatment upon themselves, and sadly, this appears to be the current response of the Israeli media to the slaughter in Gaza. Yes, the Palestinians have weak leadership who need to be held accountable for a number of injustices, but make no mistake, they did not pull the trigger on unarmed civilians; such deadly benchmark has made the world a far more dangerous place. In short, I have grave concerns for the future of the garden. When I left Palestine, I had a debriefing with the same Israeli commander who always treated me with generosity and respect. Upon finding out where I had been, and who I had spoken with, he shook his head and responded; ‘I honestly cannot believe that you are not dead’. Without wanting to sound cliché or naïve, I believe this is because I never lost sight for the value of human life and the need to treat all people with dignity and respect. Maybe this is the benefit of not being part of the enormous baggage found on both sides. Hopefully we are not so naïve to think that resistance to injustice is the simple definition of terrorism, because a failure to differentiate will destroy all future hope of apeaceful resolution. Jason Hartley is a cultural diversity consultant completing a PHD at the University of Queensland researching factors that impact trust relations between police and Muslim communities in a climate of counter-terrorism. Jason has further co-authored a number of published articles examining best practice counter-terrorism community engagement strategies for law enforcement. Jason also authored a book on indigenous relations in New Zealand, and is further a graduate of the Vietnam National University. Jason also has tertiary qualifications in Asian and indigenous studies. In response to 9/11, Jason was appointed State Islamic Liaison Co-ordinator/Senior Cultural Advisor for state crime operations command in the Queensland Police Service. As a consultant, Jason further trained police personnel for deployment duties in Timor Leste, Solomon Islands, Afghanistan and Bougainville. This has to be one of the most balanced and insightful articles on Israel/Palestine situation. I congratulate Countercurrents for publishing this. To the Editor – I noticed a discrepency in the surname of the author – under the title of the article this is, Hartley; and in the bio below, it is Hurtley. Please advise which one is correct, I need this for referencing purposes. Thanks.